Ethiopia has “no option” but to open up its politics for multiparty democracy in order to secure lasting progress, Prime Minister Abiy Ahmed said Sunday. Ahmed spoke while meeting in the capital of Addis Ababa with nearly 50 political parties, including four from overseas, “who demanded reform to include election laws,” Fitsum Arega, the prime minister’s chief of staff, said on Twitter. 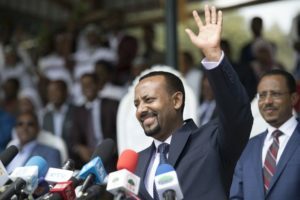 Abiy took office in April, and faces the task of bringing an end to several years of sporadic regional protests over alleged land grabs and political neglect that threatened to detail the boom in Ethiopia’s state-planned economy. Ethiopia’s ruling party has also announced plans to open up state monopolies, including sugar, airlines, and telecommunications, to foreign investors, while opposition political groups have begun to be tolerated and thousands of detainees released.